19 yo RHD M with no PMH presents with R wrist pain. 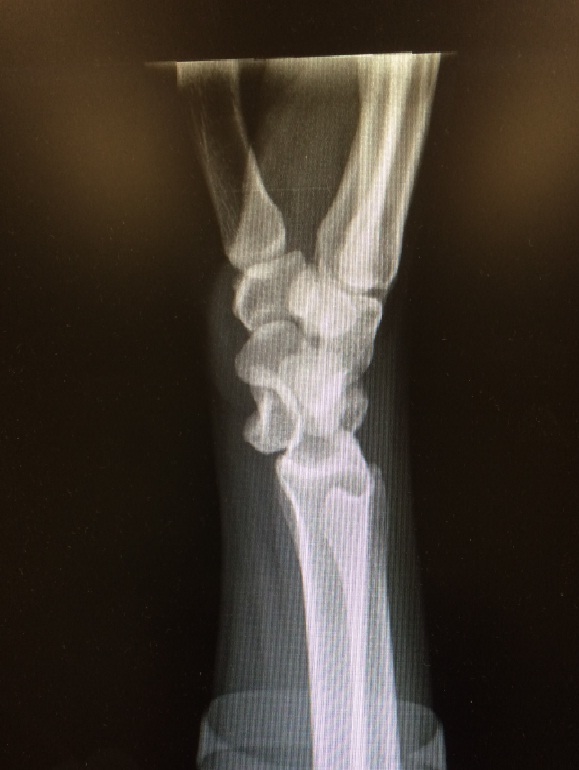 Patient was snowboarding today, jumped into air, fell backwards onto hyperextended R wrist. Seen in mountain clinic, was told most likely ligamentous injury and sent home. Took Tylenol, but continues to have significant pain, concerned about fracture. Denies injuries to head or anywhere else. Abd: soft, nt, nd, +b.s. What do you see in these plain films? What is the diagnosis? What is the neurovascular concern in this type of injury? 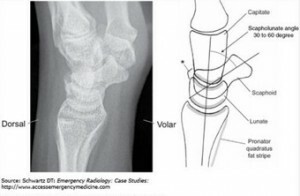 Volar displacement of lunate into carpal tunnel can cause median nerve compression. What is the best management for this patient? Carpal dislocations are important to recognize early as they portend poor functional prognosis if not treated early. However, up to 25% of perilunate and lunate dislocations are missed on initial presentation3. Missed carpal dislocations result in chronic and progressive arthritis, decreased range of motion, joint dysfunction and disability1,5. 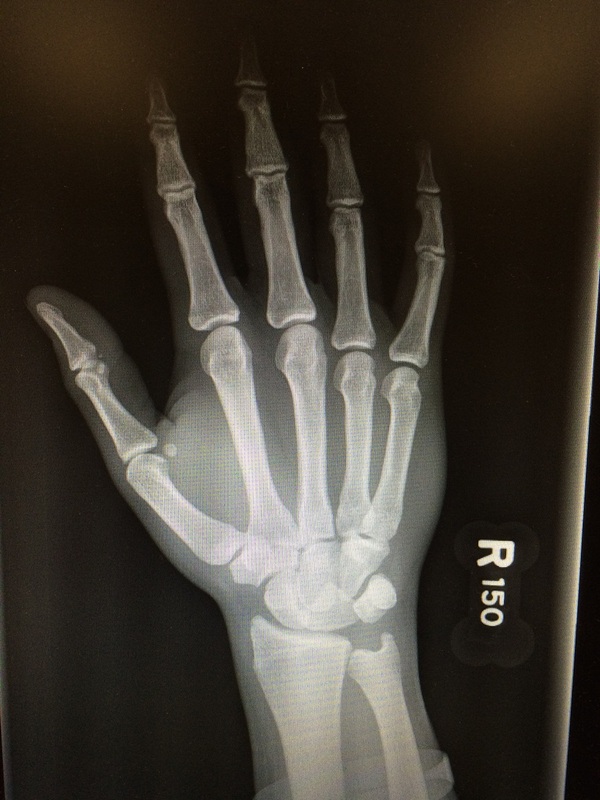 Diagnosis of carpal dislocation largely relies on plain films of the wrist. When examining the PA view of a wrist film, other than examining the carpal bones for fractures, it is important to examine the 3 carpal arcs known as Gilula’s arcs. 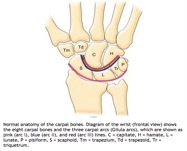 Arc I, most proximal and largest arc, include the proximal surfaces of the scaphoid, lunate, triquetrum and pisiform. Arc II spans the distal articular surfaces the formerly mentioned carpals. Lastly, arc III include the proximal surfaces of the capitate and hamate. The arcs should be smooth running parallel to each other. 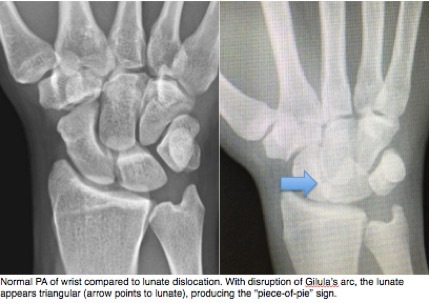 In lunate dislocations, disruption of Gilula’s arcs can be appreciated with disruption of spaces between the proximal and distal carpal bones6. The lunate is rotated forming a triangular shape commonly known as the “piece-of-pie” sign. On lateral view of the wrist film, similarly, the alignment of the carpal bones becomes important for diagnosis. There is significant overlap of carpal bones when viewed from the lateral aspect, what can be appreciated are the articulations of the lunate with the radius proximally and the capitate distally known as the 4 C’s6. The proximal 2 Cs indicates the articulation between the lunate and the radius; the distal 2 Cs indicates the articulation between the lunate and capitate. 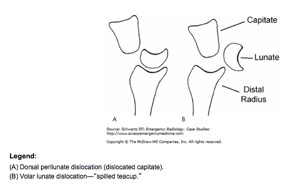 In lunate dislocations, the lunate’s articulations with both the radius and capitate are disrupted displacing the lunate volarly creating a “spilled teacup” appearance. Carpal dislocations occur in context of high velocity forced hyperextension and ulnar deviation of the wrist3. Lunate dislocation is the worst outcome on a spectrum of carpal ligamentous injury where all carpal ligaments have been disrupted. The most prominently used classification for carpal ligamentous injuries originates from the Mayfield study detailing the mechanics in the progression of ligamentous disruption. The Mayfield classification contains 4 stages. Stage I involves scapholunate dislocation most well noted on PA of wrist film with increased space between the scaphoid and lunate. 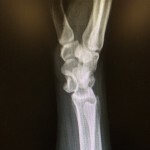 Stage II and III involves perilunate dislocations. And finally stage IV involves lunate dislocation3,5. The main differentiating factor between perilunate and lunate dislocation is the lunate’s articulation with the radius. 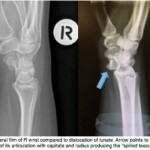 In perilunate dislocations, lunate’s articulation with the radius is preserved with the capitate dorsally displaced whereas in lunate dislocations, the lunate is disarticulated from both the capitated as well as the radius6. There is no prognostic difference between perilunate and lunate dislocations2. It is largely accepted that once the diagnosis is made, immediate close reduction and splinting should take place with close operative referral. However, some argue that immediate operative treatment of perilunate/lunate dislocations result in better functional outcome2. 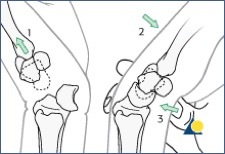 The general steps of closed reduction include traction followed by wrist extension, more traction, wrist flexion with volar pressure applied to rearticulate the lunate with the radius2-3. Escarza, R., Loeffel, MF III., Uehara, DT. Chapter 266. Wrist injuries. In: Tintinalli JE, Stapczynski J, Ma O, Cline DM, Cydulka RK, Meckler GD, T. eds. Tintinalli’s Emergency Medicine: A Comprehensive Study Guide, 7e. New York, NY: McGraw-Hill; 2011. http://accessmedicine.mhmedical.com.ezproxy.med.nyu.edu/content.aspx?bookid=348&Sectionid=40381757. Accessed August 22, 2015. Kannikeswaran, N., Sethuraman, U., Lunate and perilunate dislocations, Pediatr Emerg Care. 2010 Dec;26(12):921-4. 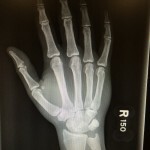 Karadsheh, M., Lunate Dislocation (Perilunate dissociation), http://www.orthobullets.com/hand/6045/lunate-dislocation-perilunate-dissociation. Accessed on August 22, 2015. 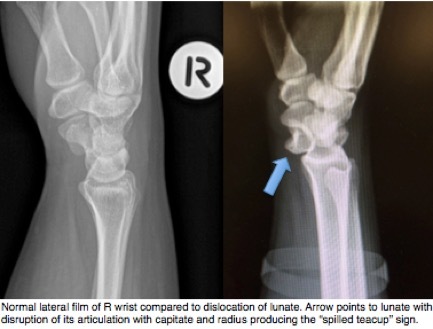 Kastelec, M., Fricker, R., Nunez, F., Carpus-Complete dislocation of the lunate, www2.aofoundation.org, AO Foundation, Accessed August 22, 2015. Perron, AD., Brady, WJ., Keats, TE., Hersh, RE., Orthopedic Pitfalls in the ED: Lunate and perilunate injuries, Am J Emerg Med. 2001 Mar;19(2):157-62. Schwartz DT. Chapter III-3. Perilunate Injuries. In: Schwartz DT. eds. Emergency Radiology: Case Studies. New York, NY: McGraw-Hill; 2008.http://accessemergencymedicine.mhmedical.com.ezproxy.med.nyu.edu/content.aspx?bookid=434&Sectionid=41825439. Accessed August 22, 2015. Di was raised in Portlandia, then transplanted to New York for medical school and now residency. 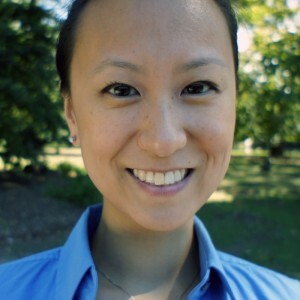 She enjoys exploring the city especially the food scene, playing with her dogs and seeking out green spaces. Her academic interests include ultrasound and education. 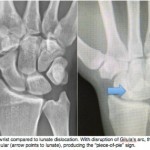 Lunate dislocation, indicated by “piece of pie” sign on AP, “spilled teacup” sign on lateral. Lunate is dislocated and volarly displaced/rotated. There is risk of damage to the median nerve. This requires urgent ortho consultation and reduction, surgical fixation. Great images for a must-know case for EM docs. Completely agree with the prior comments regarding lunate dislocations. This should be obvious as a lunate or perilunate dislocation from the PA film as well as long as one is familiar with the 3 Gilula’s arcs of the carpal bones. I’d never heard of “Gilua’s arcs” Dr. Swisher, what an awesome tip, thanks!